Modern Living with kathy ireland (September 2016) – Decora Cabinetry is proud to be featured in a kitchen and laundry room renovation on Modern Living with kathy ireland as part of the new Inspired Home series as sponsored programming, which premiered on E! Sept. 15. Modern Living with kathy ireland is an informative magazine-style program that educates viewers on the hottest stories, trends and breakthroughs. 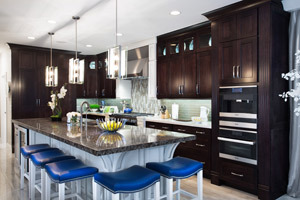 The Inspired Home series features a fully renovated house located in Florida, which has been equipped with some of the most innovative and high-quality features on the market today – including Decora Cabinetry. In the segment, Decora's Treyburn cabinet door in Maple is featured in the kitchen renovation with both Teaberry and Chantille Espresso finishes on the perimeter cabinets and island, respectively. Decora is also highlighted in the home's stylish laundry room renovation, with Maple cabinets in the Harmony cabinet door with a White finish. Tune into E! Thursday mornings at 6:30 a.m. EDT/PDT in September and October to watch this five-part series. Encore performances of each episode are also being streamed via Facebook Live on Modern Living's Facebook page.